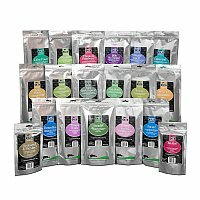 Herb Supplements - CSJK9 Ltd.
Over the last couple of years I have been fortunate to be able to work with one of the country's top herbalists and based on feedback from dog owners, we believe there is a real need for the following herbal preparations. Billy No Mates! is a totally natural mix that is absolutely HATED by ticks, fleas and mites. Simply sprinkled over your dog's food. We recommend BNM is used from early March onwards. 325g foil pouch. BNM is also available in a 1 kg pot with a saving per gram. Please note 5 ml scoop no longer included. Billy No Mates! is a totally natural mix in 'easy-to-use' tincture form that is absolutely HATED by ticks, fleas and mites. The aromatic combination of mint, seaweed, fenugreek, neem leaves and lemon balm should be simply added to your dog - or cat's food. Simply add to your pet's food or treat. Billy No Mates! is also great for skin and coat condition. We suggest BNM is used from early March but can be used year round. Trusted for over 10 years. Available in 250ml container. Are you often embarassed by your dog's amorous nature? If so, try some of our Down Boy! Down Boy! is CSJ's latest herbal blend to naturally suppress the sexual drive in dogs. (200g foil pouch). Please note 5ml scoop no longer included. A totally natural mix of Irish Seaweed & Parsley to aid your dog's oral health. This 200g foil pouch will typically last (eg Border Collie) at least 16 months.